Let me state that language is a bit of "special interest" of mine - I have a degree in Linguistics - so I have an educated understanding of language and all its idiosyncracies and beauty. While there are hundreds of languages spoken in the world, communication, at its most basic, is any two people managing to understand each other. That's it. Communication may use writing, spoken utterances or gestures, but it just needs any two people to understand each other to be valid. I have a deep respect for this wonderful human process. So why am I writing this? Because it annoys me when people criticise other people's language or communication because they "don't understand it" or they accuse other people's communication of "dumbing down society." Scientifically, this is absolutely ridiculous. Politically, it's bigotted, sometimes even ableist. "On fleek" has been in use since 2014, if you use Merriam-Webster as a source, or 2009, if you go by whatever you find on the internet. Either way, it's not a mainstream word and not everyone uses it. However, you'll get plenty of people criticising it and other "slang" words' use. "I don't get get it. It sounds stupid! Why can't people speak proper English anymore!" You can't stop time and change, sorry to break it to you! No matter how much you complain, new people will do new things. The world changes and you're kinda stuck either adapting or being really unhappy. Who made "proper English" (whatever that is. That is not a scientific category) the Holy Grail of languages? These words or language being used aren't for you to understand. In fact, many speakers much prefer you not understand. Remember how I said communication is any two people being able to understand each other? Sometimes languages develop specifically because the speakers don't want anyone else to understand them. If we look at the development of many creoles in the Caribbean, this is exactly what occurred. People from different African countries were stuck together on slave boats. They did not share a common language, so they had to find ways to communicate with each other. By mixing words and phrases from their own languages, and those of the slave drivers, they were able to create their own languages. In Linguistics, we call this a pidgin. Ideally, they did not want the slave drivers to understand them - I think we can all appreciate why this would be. 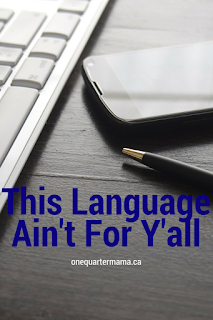 When a pidgin evolves and a basic grammar starts to emerge, it becomes a creole. The point I need to make here, however, is not only is language in constant evolution (just like people! ), but the necessity to have communication that is solely for the understanding of certain groups of people has been going on since we started communicating with each other. Social groups use different methods to make themselves distinct such as diet, dress, creed, and of course, language. Is it really any surprise that teens might make up their own words and use them with each other, maybe so their parents don't understand? It's creative and genius. There's nothing unintelligent about it and it certainly doesn't affect any one else's use of the dominant language. Or if we look at African American Vernacular English (AAVE), again created by a racial group, which can serve as a marker the user is part of that social community. It's how people relate to each other. Contrary to "dumbing down" English (or any other language for that matter), all users of a creole or a vernacular speak the dominant language of the area (English) - meaning they are actually bilingual or polyglots (multi-lingual). They're actually using more of their brain than unilingual people. As it's all communication, I see all languages (spoken, text, sign, morse code) as equally valid. A pidgin is not any less useful than "proper English" - both get the job done. Pidgin poety also exists, so fear not, the arts are not neglected. When people hear slang and complain, "that isn't an English word! I don't get it! It's dumbing down society!" that's like saying Italian is going to ruin English because you don't understand it. And really, don't be so full of yourself. It's not for you to use. It's not even for you to understand. You're not part of the group that is using it! You weren't invited into their conversation. You're being the rude one if you're jumping in and demanding you understand other people's private (or exclusive) conversations. Remember that any group of people excludes others from their conversations in many ways. Inside jokes are one. Or a family that uses a term for something their toddler came up with and it stuck forever. My husband's family has an "oompa." What is that? You can guess, but unless you're part of his family it doesn't make sense for you to know or understand. There's no reason for you to start using it, and his family's use of it doesn't somehow hurt the whole English language and threaten its very existence. Certain words and phrases come into use because of spelling errors, or short cuts in written language (texting) being necessary or common. What might look "lazy" to you could just be someone's dyslexia. Is it really fair to complain someoene's learning disability is not only annoying you or is "ruining" the language? If that's the case, I don't want to hang around you.